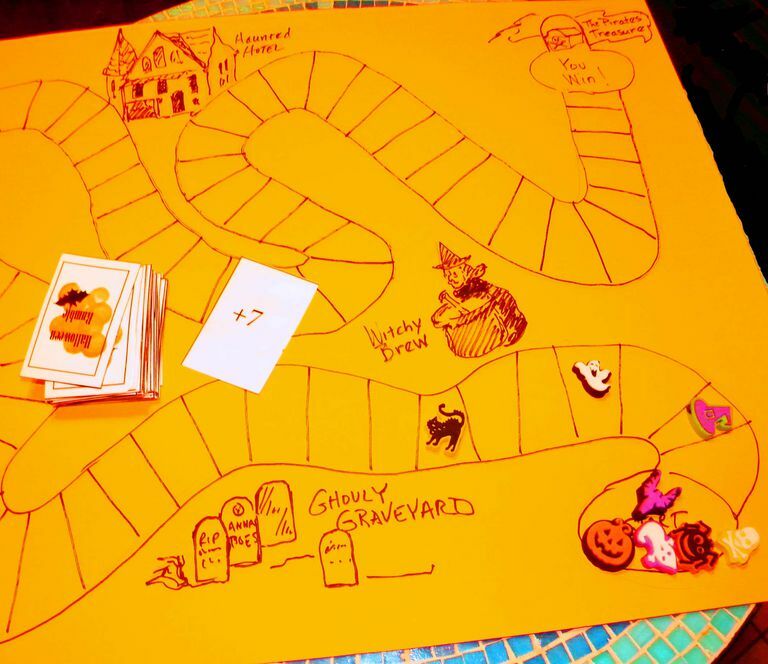 A Halloween Board Game supports student's understanding of addition and subtraction. Games are an effective tool to support instruction in special education. When your students know how to play a game, they can play it independently. Some board games and many electronic games are available commercially or online, but they don't always support the skills that your students need to build. At the same time, many online computer games fail to support social interaction, which is an important benefit of supporting instruction with board games. Drill and Repetition: Students with disabilities often need lots and lots of practice on skills, beyond what they would receive in a general education class, in a more naturalistic approach to instruction. We also know that students have difficulty generalizing skills, so games that use math or reading skills in a game will motivate children to use those skills across more social settings. Social Skill Training and Practice: Many children with disabilities, especially developmental disabilities such as autism spectrum disorders, have difficulty with social interactions. Board games support waiting, turn taking, and even "losing gracefully," which both typical, and children with special needs struggle with. Games can even be designed to support social skills, such as a social skill game that requires students to complete a social task successfully ("Say hello to a friend," etc. ), to stay on a square on the board, or you can make some social skills cards for existing games (Chance cards on Monopoly?). Peer-Mediated Instruction: Children with disabilities benefit from having skills modeled by typically developing, non-disabled peers. Those skills will include both academic and social skills. The typical peers will be sure to check the work of their challenged peers and can supervise play. Games as part of inclusion give both groups opportunities to practice skills, exercise some socially appropriate behavior, and build positive peer relationships. Kids love bingo. Kids with disabilities love bingo because it doesn't require knowing lots of rules, and since everyone plays through every game, it scores well on the engagement scale. It requires that they listen; identify the numbers, words, or pictures on the card; place a cover on the squares (fine motor skills), and recognize the pattern of covered squares. Many bingo games are commercial and available through online or brick and mortar stores. Teaching Made Easier, an online subscription tool for making games is an excellent way to make sight word, number, or other sorts of bingos, including picture bingos. Vocabulary Building Bingos: These bingos have children cover pictures of animals or items in other categories to build receptive language. Number Recognition Bingos: Teaching Made Easier makes it possible to customize the range of numbers used for Bingo. You can make one set of cards that uses numbers from twenty to forty to give students practice in recognizing numbers larger than twenty, but not the "whole shooting match" up to 100. You can also ask students with strong number recognition to read the cards, as it helps them build their skills in reading numbers aloud. Educators often recommend that some "recitation" in math instruction is included to be sure the numbers also get into students' mouths. You can build a board game based on any number of different games: Parchesi, Sorry, Monopoly. The simplest games are simple games that start at one place and end at the finish line. They can be used to support counting, or they can be used to support specific skills. You can use dice, or you can create spinners. Many Math series provide spinners that you can adapt: Once again, Teaching Made Easier provides a template for spinners. Counting Games: An example is Halloween Rumble. Start with a serpentine path divided into squares, use dice (to building counting and adding skills) or a spinner. You can use a spinner for skip counting games (by 2's and 5's). Social Skills Games: Design this after games like "Life" or "Monopoly," where students take cards to complete a social skill. Perhaps you might have a stack of "requests" such as, "Ask a friend for help on your math," or a greeting: "Greet a teacher in school." A great way to help students prepare for a test is a Quiz Show format. Build your game like "Jeopardy" and make you categories support whatever topic your students are preparing for. This is an especially good tactic for a secondary teacher who can pull a group from a content area class to prepare for a test. Games are a great way to engage your students, as well as give them lots of opportunities to practice skills and content knowledge. They seldom realize that the whole time they are "competing" with their classmates, they are supporting learning with their peers. It can provide some formative assessment information, letting you see whether a student understands a skill, a content area or a set of concepts.